... even though he has been correct only 39 percent of the winters between 1887 and 2011. 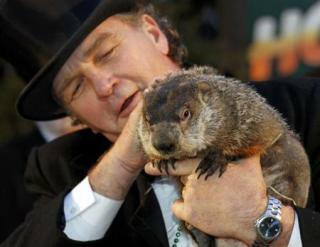 This year, Phil's prediction is being refuted by many well-known human prognosticators, so we'll see how well the great groundhog fares against them. controlled area of the town library, and every summer they drink a sip of secretly formulated Groundhog Elixir, which adds another 7 years to their lives.